Background No.1 Traveller launched its first lounge at Gatwick Airport’s South Terminal in 2009, followed by two facilities at Stansted (by gates 16 and 49). 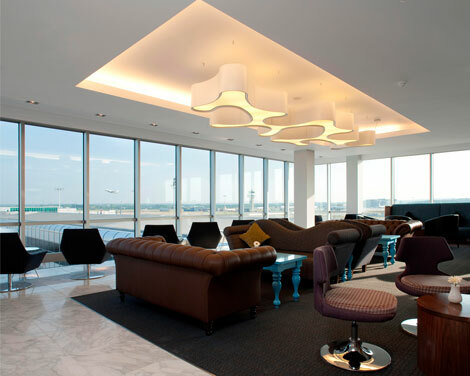 This second Gatwick lounge opened in May this year, and is located at Gatwick’s North Terminal. The brand is also set to open its first Heathrow facility at Terminal 3 in August, complete with bedrooms with ensuite showers and on-demand movies (see online news March 25). The group also offers chauffeur-driven airport transfers to and from Gatwick, Heathrow and Stansted, with examples prices including £100 from Stansted to the City of London, and £75 from Gatwick to Brighton. Where is it? Behind the WHSmith store to the left after security, in what is referred to as the Lounge Pavillion. No.1 Gatwick – North Terminal is located on the same floor as the Duty Free shops, with Servisair, Emirates and BA Club / First lounges are also located in this area. Facilities The North Terminal lounge is the largest of the No.1 Traveller facilities so far, at some 10,000 square feet, in part because it is the first of the group’s lounges to feature a travel spa (more details below). 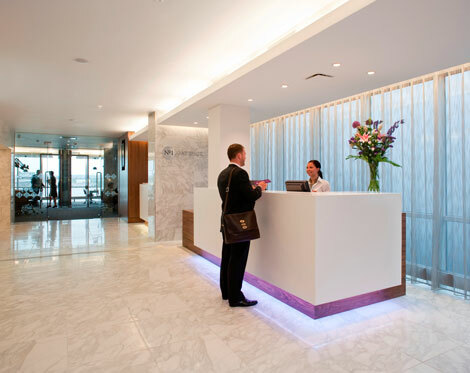 As guests enter the lounge there is a chaise longue next to the reception desk, with the travel spa opposite. Lounge décor is bright, with white marble-effect flooring, and a modern colour scheme including a mixture of purple and cream furniture, wood panelling, and wallpaper depicting shelves full of books. There are reminders of travel throughout the lounge, including purposely piled up empty suitcases in different colours and styles. 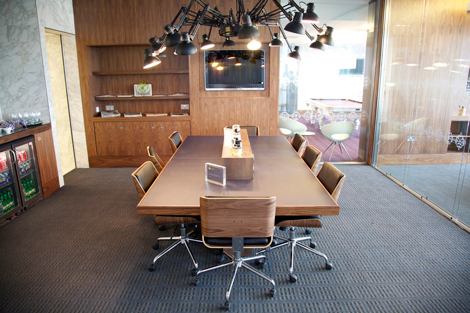 Past reception there is a business centre with four PCs, several desks with power sockets, a selection of newspapers and magazines, and two meeting rooms, one of which is glassed walled and features a large wooden table, flatscreen TV and fridges with soft drinks. These rooms can be booked in advance or on arrival, at a cost of £12.50. Wifi internet access is available free of charge throughout the lounge. I did not use this, but my travelling partner said that he found the initial sign on process a little tricky due to the formatting of the page on his iPhone, but that once logged on it worked fine. Following a corridor round to the left there is a games room on the right hand side, with a closed off TV area featuring a Playstation games console. Opposite this there is a bank of Apple Mac computers, and past this is a room with a purple pool table and a flatscreen TV. 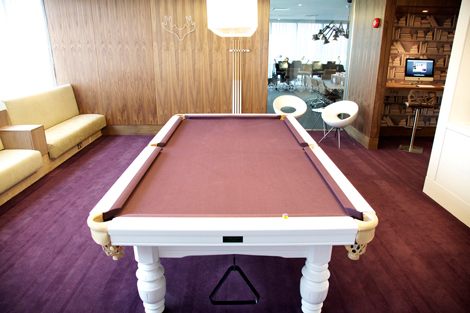 We played a few games – the table is of good quality, although of the four cues in the rack only one had a tip, and there was no chalk – slightly disappointing given the lounge had only been open a few weeks. Toilets are located past the games area off to the left (although not signposted) – showers are available but on a paid-for basis (a fairly steep £10 considering the initial entry charge for the lounge) in the Travel Spa. The lounge then opens up to reveal several seating areas – one close to the self-service buffet, and a larger one past this by the windows, looking out onto the airport. Here there are a choice of comfy-looking leather sofas, as well as single armchairs positioned by the windows. To the left is the main dining and bar area, with seating designed to feel like an outdoor café terrace. From here guests can order hot food choices, as well as coffees / tea and alcoholic drinks. There are several departure boards in the lounge, but note that flights are not called by staff. Food and drink All No.1 Traveller lounges offer complimentary food and drink, including tea, coffee, soft drinks, wines, beers and spirits. The only exception is champagne and “tailor-made cocktails” which are available for an extra charge. In this particular lounge there is a self-service buffet counter by the lounge area, which when I visited was offering cereals, fresh fruit salad, fruit juices, and glasses of what looked like muesli and yoghurt. In addition food can be ordered from the tables in the bar area, with a breakfast choice including eggs benedict (which ordered and which arrived promptly, with the egg yolk nicely runny), eggs Florentine, bacon rolls and vegetarian omelette rolls. The daytime menu is available from 1100-2200, with example dishes including soup of the day, house salad with beetroot and goat’s cheese, pizza, warmed chicken Caesar pitta, pork pies served with piccalilli and vegetable chips, and broad bean and goat’s cheese tartlet. The Travel Spa Spa treatments range from 15 to 55 minutes, and include massages (from £15), manicures (from £18), facials (from £18), and hair treatments (from £20). 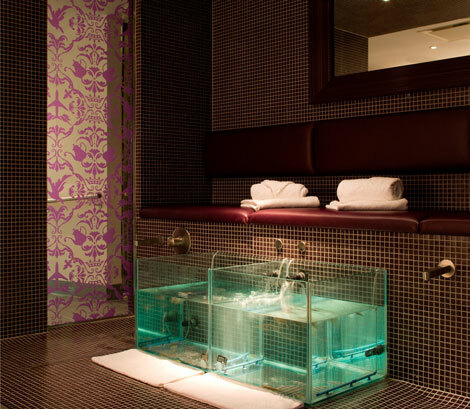 There is also a choice of a 15-minute fish pedicure for £15, and showers are available for £10. Who can use it? Entry to the lounge costs £20 per person when booked in advance online, or £10 for children aged 2-11 years. Each booking is valid for a three-hour stay, although this can be extended at a cost of £5 per hour. 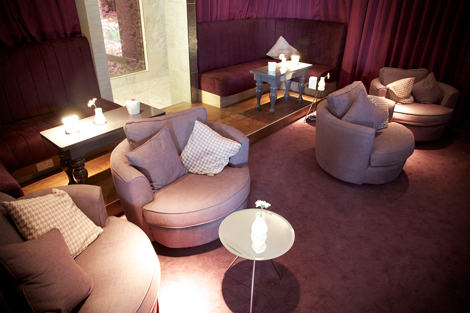 There is also the option to upgrade to a visit including a glass of champagne or choice of cocktail for £25. No.1 Traveller has also partnered with Delta, allowing free entry to the carrier’s BusinessElite passengers, and those with Skymiles Medallion and SkyTeam Elite Plus tier membership. Verdict Modern, bright, and with good facilities for both business and leisure travellers, and plenty to keep both adults and children occupied, the lounge is a welcome addition to the No.1 Traveller portfolio. For a comprehensive online guide to Gatwick airport, with details on hotels, lounges, meeting options, parking, dining, shopping, and future developments see the July / August 2011 issue of Business Traveller.